Why fingerprick when you can scan? The question asked of us by Abbott when they launched the Libre. In a sentence, “Because you must.’ may be the answer. But these things are marvellous, they have great reviews. and yes they do, but there are sensors out in the wild that really don’t behave themselves. 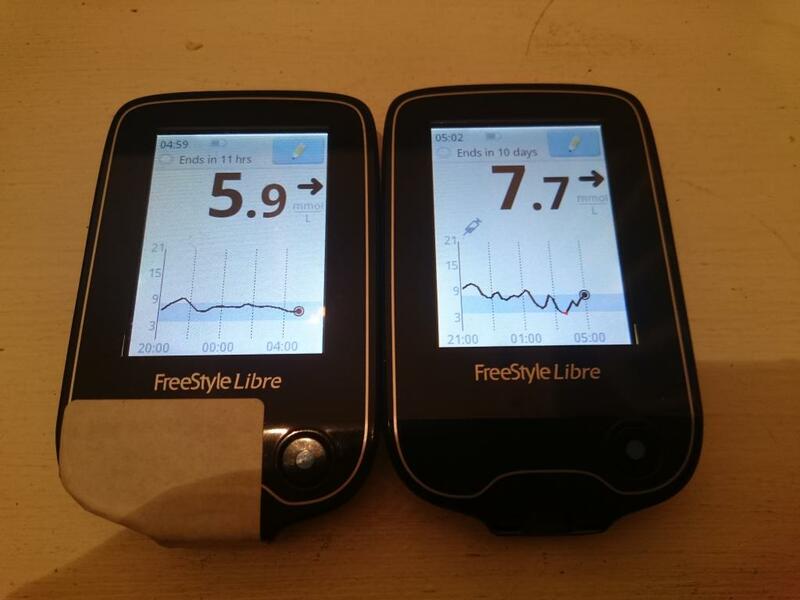 I’ve always said, and I’ll continue in the vein, that the most important thing that the Libre system gives you is the ability to get hold of a cheaper CGMS. The trend data allows you to understand what is happening to your glucose levels and to make appropriate changes, safe in the knowledge that you’ve tracked things accordingly. That’s the greatest strength. But what when things go wrong? Well then you’ve a different set of data that isn’t all that helpful. 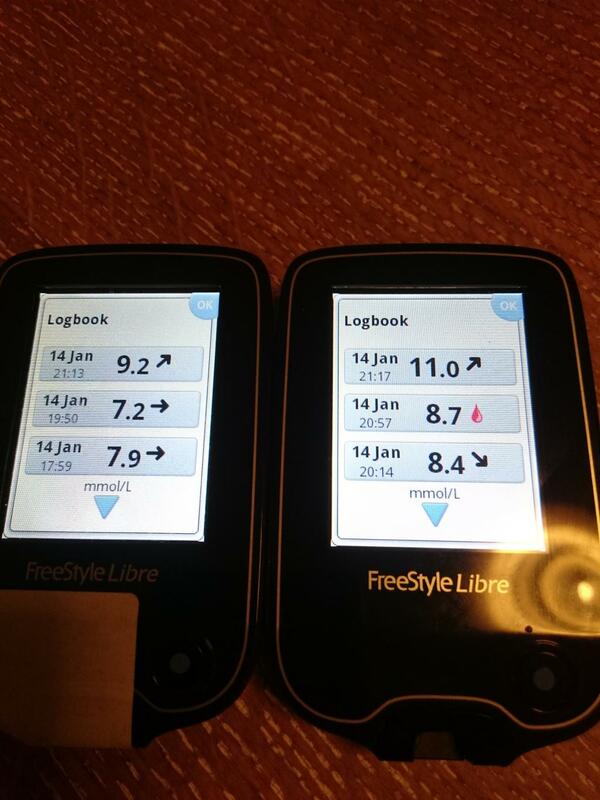 The old sesnsor showing at 9.2, the new one showing at 11.0 and the blood glucose level at the time being 8.7. Consistently, the old sensor showed a reading below the blood level but not this time. Thee is also now a persistent itch from the old one, and I have noted that the edges of the sensor sticky pad continue to lift, to the extent that the pad under the body of the sensor is sometimes now visible. It only has another eight hours or so though, then it goes to Abbot for some “work”. 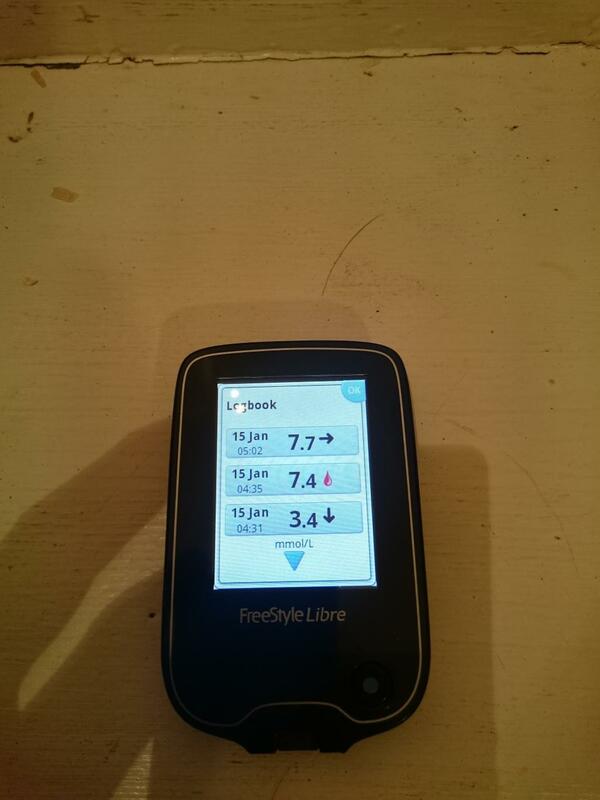 And what of the new one, showing a level that is 2.3 mmol/l above the blood level? 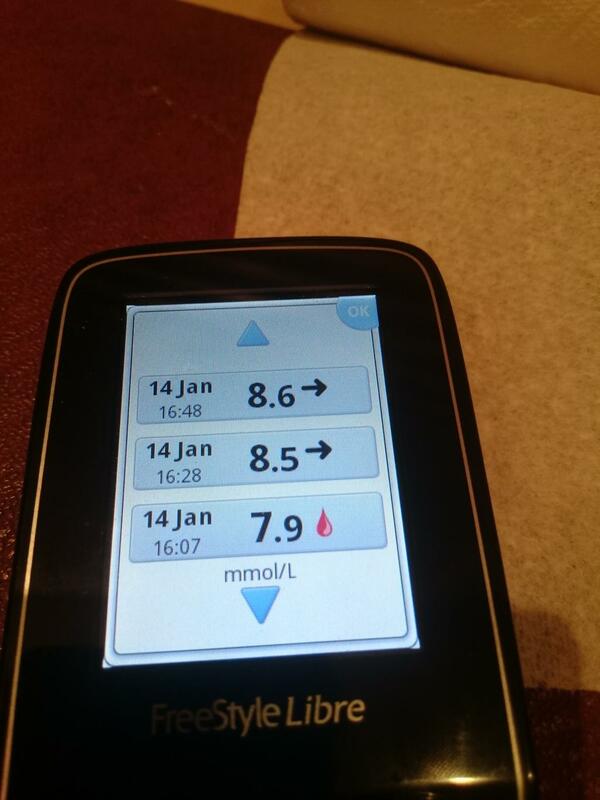 This isn’t great… The trend arrow indicates a rising blood glucose level, but not a rapidly changing one, so the results are supposed to be similar in this scenario, aren’t they? But earlier in the day, the differences were lower. A few hours earlier, we had what was practically alignment on the new sensor. Now just to make this more fun, there was also my first experience of the ‘don’t lie on the sensor’ issue that some have reported. The trend graphs overnight between the two sensors are totally different and I know that I woke up lying on my sensor (the lowest read line occurred as my alarm was going off). It seems it really does read low in this scenario. We can see that the scan recovered after the pressure had been off the sensor for five minutes or so. Of course, I’ve been doing this with two sensors, and I know enough about the way my body works to look at this morning’s graph and say “Wait a minute, that doesn’t look right.” I also have two sensors at the moment to make a comparison between. How do you know if you have a bad sensor, or if it is misbehaving though, when you have only one? You have to fingerprick. So coming back to the first question I raised. Abbott’s question. “Why Fingerprick when you can scan?”. The answer is still “Because you must.”. *Okay, I get it that Libre isn’t feminine and it’s supposed to be said in a Spanish way, but, give me a break. It scans very nicely as the French pronunciation!